About 80% of North Carolina's 18 million acres of forest land is privately owned. Keeping this vital natural resource healthy and productive depends on careful, science-based forest management. Through the NC Forest Service's Outreach Program a landowner can learn how to access professional advice about managing his or her forest, including tree planting and forest pest eradication. The Outreach Program works to raise awareness of the management assistance and other offered programs and services to minority landowners, who have traditionally been underserved by the agency. Traditionally underserved landowner groups include African Americans, American Indians/Alaska Natives, Asians, Hispanics, Native Hawaiians/Pacific Islanders and women. A landowner may not be taking advantage of the agency's services due to reluctance to engage in governmental programs or because forestry isn't a priority for their farm management. But thanks to partnerships with community-based organizations, local cooperatives, federal, state and county natural resource agencies, and other non-governmental organizations, the NCFS is able to reach an increasing number of minority communities and landowners. Many people welcome new information and ideas but prefer to remain in the comfort of their home when obtaining it. Therefore, the NC Forest Service focuses on delivering information directly to communtities. The agency's Outreach Coordinator is available to organize presentations and meetings for landowner groups, cooperative, or community organization at any available community facility. 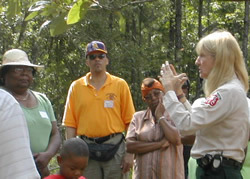 The coordinator can also assist with developing workshops and locating other natural resource professionals that can provide assistance. If you would like to develop a meeting or workshop for your community, or if you have other questions, please contact actiong Outreach Coordinator Beth Romer at 919-857-4819. To meet the challenges of sustaining North Carolina's vital natural resources, committed people are needed to fill roles in the N.C. Forest Service as foresters, forest technicians, hydrologists, wildlife biologists, environmental researchers, administrative support staff and other important positions. A career path in forestry or natural resources is not only about being in the woods; its also about the implementation of forestry practices based on scientific research, social interaction, and economics, as well as interacting with a diverse array of people. If you think a career in forestry or natural resources will connect you only with creatures of the woods, you are mistaken. A career path in forestry or natural resources will allow you too work in a variety of environmental systems and interact with people in ways you never dreamed of. This path will challenge you to develop new ideas and innovations to sustain our delicate ecosystems. A career in forestry or natural resources allows you to give back to your environment, your community, and your world. Representatives from the NCFS are happy to participate in school career days and similar events. For more information please contact acting Outreach Coordinator Beth Romer at 919-857-4819. The Outreach Program at the N.C. Forest Service continually strives to improve its outreach efforts to the citizens of North Carolina. These efforts are too ensure inclusive awareness and use of the agency's programs and services. The outreach program has several areas of focus. These areas include public and landowner outreach, career outreach, and employee recruitment. The outreach program is committed to reaching the public, farmers and forest landowners about the many roles forestry plays in our state's well being.